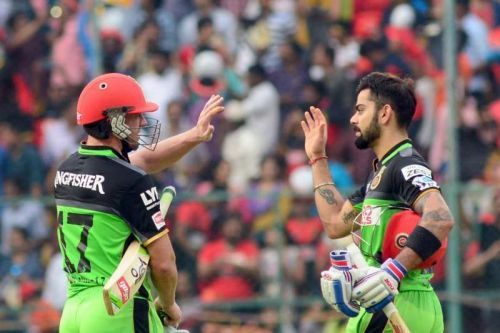 Ever since the start of the Indian Premier League, the Royal Challengers Bangalore have always been a fan favourite team. One of the reasons for such a massive fan following are the star players - Virat Kohli, AB de Villiers, Chris Gayle, Jacques Kallis, Rahul Dravid, Anil Kumble - who have donned the franchise's colours. Over the years, the Bangalore-based franchise has been through a roller coaster ride and was just a step away from lifting the coveted trophy on three occasions. In 2009, 2011, and 2016 seasons, the Bangalore team reached the finals of the tournament but were defeated by Deccan Chargers, Chennai Super Kings and Sunrisers Hyderabad respectively. In spite of them being one of the only three franchises in the tournament to not lift the trophy, the Royal Challengers were involved in many thrilling matches. On that note, let us have a look at three such thrilling chases by RCB in this article. The 52nd match of the 2015 IPL season between Royal Challengers Bangalore and Sunrisers Hyderabad was key for both sides in order to make it to the playoffs. The Bangalore-based franchise's penultimate league match was expected to be a thriller as SRH had stopped RCB making it to the playoffs on previous occasions. The high-stakes match was reduced to an 11-over match due to rain and both sides needed a win in order to keep their playoff hopes alive. In the first innings, the home team scored a total of 135 runs in 11 overs, thanks to half-centuries from David Warner and Moises Henriques. During the last few balls of the SRH innings, the rain started pelting down and as a result, the RCB's target was revised to 81 off 6 overs. Chris Gayle gave Bangalore the perfect start as he blazed to 35 off just 10 balls. Just when it seemed like RCB will cruise through the chase, Henriques got the wickets of Gayle and the dangerous AB de Villiers off two consecutive balls. Two quick wickets increased SRH's odds in the match but Virat Kohli had different plans. After the two quick dismissals, Kohli kept his side in the game by accumulating 14 and 10 runs in the next two overs respectively. With 13 runs needed off the last over, David Warner handed over the ball to Bhuvneshwar Kumar who gave away just one run in the first two balls. Off the next two balls, Kohli hit two fours and reduced the equation to four off two balls. With the side needing just four runs, Kohli backed himself to clear the fence but hit one straight to Warner at long off but luckily for him, the Hyderabad skipper stepped on the boundary line giving away six runs. As a result, RCB won the match by 6 wickets with one ball to spare.